Discussion in 'Forum Games' started by Demon God Ivuul, Sep 30, 2018. 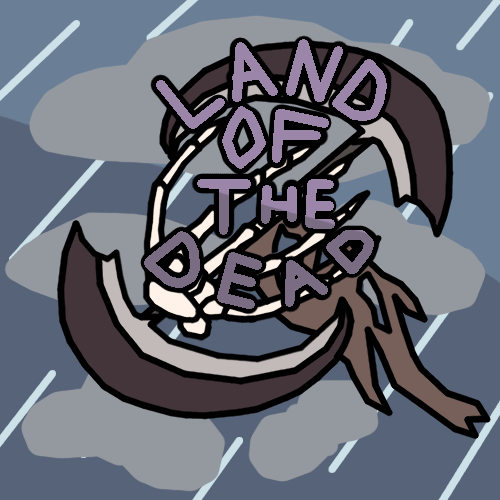 Welcome to the Land of the Dead, my 5th major Text Adventure! but don't fret, unlike my other Text Adventures, this one has almost no connections to the previous 4. Without further ado, here are the rules! Don’t try to take control of the story, but rather, progress with the story. Please try and be fairly active, and let me know if you will be unable to do your actions. Don’t be a King of Terraria. What do you mean by a "King of Terrarian?" King of Terraria was a player from round 1 of the 'In the Shadows of Ivuul' saga, he became particularly infamous among the active players at the time for having actions lacking any substance such as 'yo-yoing', 'explore' or 'build castle', he had no interest in making valuable contributions to the game. Character had to have been a human in the past unless playing as a race that specifies otherwise, likewise this human must come from normal everyday earth. Terrarian OC’s will be denied instantly, they are bland and boring, and frankly, aren’t exactly original. 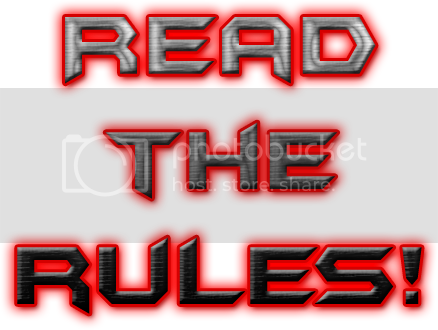 This rule is not retroactive for any currently playing Terrarian OC’s. One final thing, All characters start with an item that is bound to them known as the Asmowatch. a device that will allows you to talk to teammates via radio and even allow you to listen to radio/tune into radio frequencies. The Races of the Land of the Dead come in all sorts of shapes and sizes, powers and abilities, ect. although not all races are playable, the few that are should be diverse enough to keep everyone satisfied. The common lost soul is one of the worst possible races you would want to be in the Land of the Dead, they are essentially humans, and that's really it. The Zombie is a fairly common race throughout the land of the dead, typically being rotten and having ripped up clothing with a choice between green or blueish skin tones, you have no sense of smell and your limbs can break off easily. on the bright side though, you can eat things that would otherwise be bad! +Can tank a decent amount of damage, usually only losing your limbs. +Can reattach lost limbs or outright replace them provided you got the methods to. +Your horridly rotten smell might deter some monsters from sticking around in the battle. +Despite the stereotypes, most zombies tend to have a pretty high IQ. +Can eat harmful food items and receive good benefits from it. -VERY fragile to slashing attacks. -Head is your weak point. +Infinite supply of throwable bones. +Can regenerate broken bones provided they have time to focus energy in doing so, can also focus their energy to restore the broken bones/limbs of allies. +Can place limbs in different places essentially reshaping their form into anything you want. +Milk related items upgrade DEF. -Known to fall to pieces VERY easily. -Massive weakness to crushing attacks. -Heavier armor cannot be worn due to no muscle mass. Ghosts can be a dangerous foe, but they do come with a number of drawbacks. +/-Can go into a Wraithform, a powerful form with claws that is a force to be reckoned with, but be warned! Wraith forms can go berserk and might be hard to control. -Has a hard time controlling their emotions, if a ghost is happy, then they will make sure to let you know, if their sad? Expect many tears… too much anger is known to force a ghost into wraith form. +Can phase through most known matter. +Can take possession of monsters that are weak of mind. +Most attacks can phase through you not harming you, but Magic,Other Ghosts attacks,Holy Attacks and Eldritch Attacks can still harm you. -Cannot equip armor unless the armor is also a ghost. -Cannot eat food items, including revival food items. Dullahans are a bit of a weird one, they look human in every way shape or form, with the minor fact that their head is cut off, typically a dullahan has to carry their own head or keep it tied onto their necks via a really tight scarf or tie. +Could pass for a human when wearing a neckwear. +Expert at melee weapons and skilled in support magic. +Your head and body have two seperate HP bars. +Can learn exclusive head abilities. -If seperated your body could act on it's own and not want to listen to you. -Known to feel very uncomfortable if your head is to fall off in front of people. The Anubian race are a race of purple,white,brown or blue furred jackal humanoids with Crimson,Jade or Golden eyes that thrive in the desert sands. They are also referred to as a Perfect Mummy, as mummies are a failed and feral version of an anubis. The Anubian race are also VERY into fashion and because of that clothing and fashion has become a huge part of their racial culture. +Amazing spellcasters, but can thrive pretty well fighting with just their claws. +in fact, they can deal bonus damage if they fight unarmed. +Can go onto all fours and sprint to move faster. -Guns & Bows do not suit your style at all. -Crafts are slightly less interesting if the thing you are crafting isn't clothing/armor. The vampires are considered the most regalist of the Undead Races, typically living in large groups in an afterlife of luxury in their mansions. They possess many abilities, but also some more stranger weaknesses. +Can drink blood from enemies to restore HP. +Can assume the form of a Bat,Wolf or Mist. +Can teleport a short distance. -Will get a bit irritable if you haven't fed in awhile. -Garlic annoys you and messes with your senses. -Wooden Stakes deal extra damage, so does holy. -Cannot enter someone's house without permission. The Pumpkin Person race are a race of plant-like aliens whose heads possesses some similarities to that of a Jack o Lantern. this race is said to be nothing more than a legend. this race was never a living thing in the world of the living and to avoid causing a panic that the Pumpkin People exist, this race must hide themselves behind clothing and masks usually. +Isn't affected by Eldritch damage and has a good resistance to shock damage. +Can create high tech masks that can disguise your form from others. +/-High intelligence, but magic is a bit hard to understand. -MUST hide their true form when in the public. The mighty dragon wolves are a powerful and vicious race, experts at Breath attacks, and claw attacks, the Dragon Wolf is a threat to be reckoned with. and for many story related reasons, these are often seen as a hated race by many in the Land of the Dead, play with caution! As a Dragon Wolf, you were born here in the land of the dead and never was alive. +Resists breath attacks and eldritch damage pretty well. -Often looked down upon and hated/feared by many. Specify what your items and abilities do, don't make them over-complicated, and for the love of everything good, don't make it overpowered. Consider looking at currently active characters below the rule as a reference. Last bit of Gameplay Notes. Presents are the treasure chests. You can Team up with other players, If you so desire, Teams can only have 3 characters, But teams can temporally team up with each other for certain instances, Bigger groups of players attracts more dangers. Watch out for Anti-Player Enemies/Events. On death you will be given four options: Choose an item to sacrifice and revive,Sacrifice money and revive or sacrifice max HP to revive, or you could just stay dead and be instantly removed from the game should you wish. You can also be revived by teammates via revival items/spells. You can level up and every so often get to pick a new perk! You can learn new skills and magic through leveling up and perks. There is a Karma system, so you may be good or evil. but keep in mind that Evil comes with a serious price. There is a limited amount of inventory space, but there is ways to increase that! 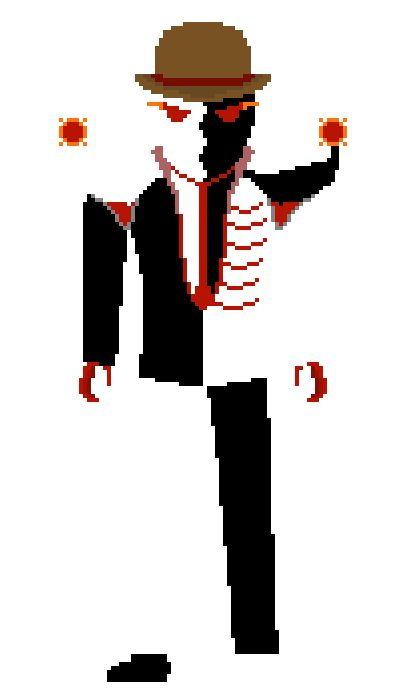 A player named Mr. Fury will be controlling most of the monsters and bosses, he WILL be doing his best to make you suffer and end your afterlives for good. The "Fan Favorite" Chimera is back once again, although this time he is looking a little... undead... You cannot kill him but should you try to fight him he may end up one shotting you! RUUUUUN! Please be respectable, and remember: General channel is for memes only, while the memes channel is for General chat only! We also have a VERY heavily WIP wiki! Black named locations are owned by the Hands of Death and allies. Red named locations are owned by the Crimson Guard and allies. Normal named locations are unowned. Cause of Death: Bleeding out from the blood veins in his head exploding because of how angry he got. Backstory: Greyton was always an angry and non-social person. If anyone were to do something that would annoy him, he would never stop yelling at them. He always wanted to win arguments, even if that means including violence. One day he was so frustrated and annoyed to the point, that his veins in his head all popped at once. Asmowatch: Does not take up a slot, a watch that allows you to listen to the radio and talk with teammates from far away. Slot 1: Ghost Mug: A mug he broke and now it haunts him, he can also throw this at people. Slot 2: Double Burger: A hamburger with two pattys, restores 60 HP. Slot 4: Turtle Shell: A Green Turtle Shell that can be tossed as a throwing weapon in battle. Intimidating Shout: Greyton shouts violently at his enemies. This has a chance make lesser enemies run away. Otherwise enemies will merely lose some of there attack and defence. Do lots of Harm: Greyton puts a lot of pack into his punch which deals double his basic attack and can stun enemies. Some, Anger Issues: Most things Greyton can handle, but being annoyed or disagreed with will anger him quickly. Too Old For This: If Greyton sees something that makes no sense, it won't bother him, until it annoys him of course. Passive: Spectral: Only harmed by Magic,Holy,Eldritch or things specifically designed to hurt ghosts. Ability: Possession: Can try to possess lesser enemies. Passive: Can phase through most matter. Ability: Invisibility: Can become invisible. Passive: Cannot equip armor unless it is for ghosts. One Time Ability: Not Random Acts of Violence: Greyton powers himself and any teammates up, this increases the chance for smash attacks by a bunch and halves the amount of damage taken for 2 turns. Appearance: The tendrils near his shoulders can form his arms or retract. 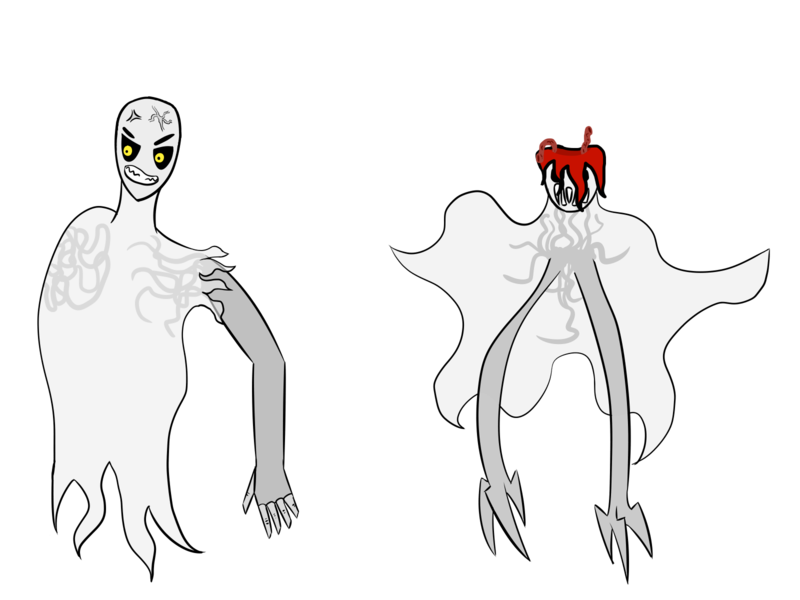 Left is Normal form, Right is Wraith form. Jeez that's a big picture. Backstory: He used to be a spec ops sniper until he had to quit due to his depression that eventually drove him to suicide. Appearance: A simple human with a military outfit. Inventory: Asmowatch: does not take up a slot, a watch that allows radio and walkie talkie functions. Slot 3:Ghostly Gibus: DEF of 1, a torn gibus with a little ghost on it, loved by Peasants and Ghosts. Severe depression: May seem cold and distant due to seemingly not having emotions. Cannot get ANY status effects based on emotions, be they good or bad. One Time Ability: Suicidal tendencies: Lesser enemies have a 50% chance to commit suicide, applies separately to each enemy. Cause of Death: Poisoned, stabbed in the legs, shot 23 times in the back, and thrown into a river. Died from drowning. Backstory: Revered by most, respected by more, hated by everyone else, Phaedra had an extensive criminal empire with deathly loyal footsoldiers ranging all over the globe. Phaedra made motions to even control the whole of the Italian Mafia. This went awry when one particular boss saw through his ingenious plan and convinced the Mafia to turn against him. Inventory: Asmowatch: Does not take a slot, a watch that has a radio and walkie talkie system. Slot 1: Scalpel- A good memory from a dead friend. Slot 2: Customized Nagant M1895 Revolver- some Russian would pay a pretty penny to have it back, DMG of 30 [EQUIPPED]. Slot 5: Ghoul Gauntlet: A type of bladed glove/claw type weapon. it resembles a ghouls hand a bit. it can tear through fleshy foes with ease and since the claws are laced with silver it will do extra harm to undead and dragonwolves. Slot 6: SCP-500 Pill: a rare red pill that fully heals and cures of everything. Vein Thresh- Phaedra strikes accurately with his scalpel to extract a blood vessel from an enemy, lowering their damage output and doing 10 damage. Phaedra can drink the blood for health or a TYFYC effect. Thank you for your Contribution- Phaedra kept information on everybody he knew, as well as everybody they knew. Now, in the Land of the Dead, the bites Phaedra gives people provide him with information about the people they interact with. Experienced Sociopath- Gains and loses karma at a substantially decreased rate, events according to karma are twice as likely. Well Known- Phaedra had a very high body count, resulting in a good number of the residents of the land of the dead knowing his face and name, whether they were enemies or allies. Racial Perks: Ability: Blood Drink: Can drink blood from an enemy to restore HP. Ability: Mist form: Can turn into mist for a turn to dodge an attack. Passive: Cannot enter someone's house without permission. Passive: Friend of Arachnid: Arachnid based enemies will not be hostile to you. Passive: Shoutouts from 13th Street: You rarely can get a shoutout from the radio host of 13th street radio…. That's it. One Time Ability: Phaedra calls upon and controls the bodies and minds of all whom he has killed on Earth, as well as the Land of the Dead. This also affects vampires he has infected. Lasts 10 turns. Cause of Death: His Head was lopped off in his sleep by a jealous, younger monk on his 47th birthday, who hid his body, making it seem as if he disappeared to his brothers. Backstory: Blind, they lived the first 10 years of their life having little idea how to safely get around. When they were about 12, they began taking classes to learn how to use echolocation to know their surroundings. Around the age of 25, he mastered to skill, and having nothing much to do, he became a monk for an unknown religion. He studied things such as zen archery, learning how to be a perfect shot while blind. One day, he found himself SEEING things- but not in a normal way. He could see a few seconds into the future, and a few seconds into the past. During sparring sessions, he suddenly improved, knowing what his opponent was about to do. At the age of 33, he gained the highest rank in his order, younger than anybody else had ever. He was murdered by a jealous, younger monk on his 35th birthday, and to the others he mysteriously disappeared. He is spiteful about this, and if he were to meet this young monk again, he would be one of those few he shows no mercy. In the land of the dead, he looks to help others, and can often be seen praying. Some say even his prayers are blessed. Appearance: He looks like a young middle aged man, is white, and slender, with milky white eyes. He used to be clean-shaven, but during his time in the land of the dead, his head has grown a flat bed of black hair. Inventory: Asmowatch: You know what this does by now, blah blah blah no slots consumed. Slot 3: Mysterious Egg: A mysterious and very slimy egg, who knows what it might hatch into! Slot 4: Malachite Masher: A Malachite crossbow that launches silver arrows that deal both bashing AND stabbing damage, extra effective against Dragonwolves and Undead. Slot 5: Cup of Sane Juice: The juice is very sane and thinks about every situation reasonably, this juice is not crazy. Slot 6: Toxic Spine Armour: Light leather armour reinforced with chain, has spikes tipped with venom across it to toxify any foes who fight without magic or weapons. Ability: Basic Prayer: Heals target for 15 points. Zen Archer: Has a double SMASH HIT chance with bows, and deals double damage with bows. Enemies have a harder time dodging his bow attacks. Blindsight: Cannot see, making it impossible to use any ranged weapon other than a bow and arrow, and can miss non basic melee attacks, but has a “disruption” phase in battle. Lost if he somehow gains to ability to see with his eyes. Ability: Head can be detached. One Time Ability: One Time Ability: Zen Miracle: SMASH HITs all of the enemies in the battle with their current bow, and gives a debuff called Armor Chink until the end of the battle, which causes attacks on that enemy to be guaranteed SMASH HITs. Allies gain health this attack deals. Can’t be blocked or deflected. Cause of Death: I got stabbed in the gut with a great-sword, kicked in the crotch, then fed to wolves, wonderful. Backstory: as a very egotistical and outright jerk not many people liked him in life, and even less in death. He was an adventurer in the 1300s looting (and burning) villages with groups of others. Notorious for “killing” 10 vampires (he actually didn’t kill any) in his lifetime. Then being stabbed, kicked, and drained of his life essence by his (supposed) 11th hunt, the crusader then died being fed to wolves. Inventory: Asmowatch: Blah blah does not take up a slot, listen to the radio and walkie talkie allies. Out for his own skin: if it’s between him dying or everyone else dying, everyone else dies and he gets out of there. Unlikeable: no one likes him, no one. Passive: (VAMPIRES ONLY!) You've learned to use your keen eyes to your advantage, you now get more SMAAAASH attacks! If it’s between you and me, It’s going to be you: at the expense of an ally’s life the opposing team dies and I survive, but I cannot team with anyone else for the rest of the game and the ultimate chimaera is more likely to find me, and Attack me. Cause of Death: He accidentally slipped on some spilled cranberry's and fell down a cliff, died whilst screaming various curse words about a chariot. Slot 3: Battery Acid: What's this icky paint like goop?...... IT'S MOVING! Can be used in crafting. Slot 6: Common Pants: DEF of 1, a common pair of pants. Perk: The Mohawker's Boogeyman: You are feared by most Mohawkers! Perk: Wild Deadlands: The afterlife isn't ALL that serious, taking this perk will allow you to have plenty of new weird and wacky encounters! Not for the serious of temperament! Backstory: Magnus was a wealthy businessman, the owner of a rather large jewelry company. He was shown to be very self-absorbed, and quickly bought many companies. After a while, Magnus met a man named Phaedra. Phaedra offered Magnus a deal with the mafia, but he refused, and the two have been bitter rivals since. Magnus isn't his real name, but don't expect him to tell you what it is. Appearance: Magnus is a purple-furred Anubis with crimson eyes. He usually has a smirk on his face, and he usually dresses in a black suit with a crimson cloak, but, like almost all Anubises (Anubi? ), he is obsessed with fashion and has many different outfits. Needle: Magnus summons a magic needle, which he can use for multiple things. If thrown at someone, it deals 20 damage. Shockwave: He creates tremors in the ground, which knocks everyone within 10 feet of him down. He can also send it in a straight line, which locks on to the person and knocks them down. Either way, it can't be used 2 turns after using it once. Smooth Talker: He is a very persuasive person when he needs to be, and is a natural charmer. Self-Absorbed: He lets off an air of narcissism, which turns many people away. Racial Perks: Passive: More damage when fighting unarmed. Passive: Heat and Cold resistance. Passive: Crafting is better with armor. One Time Ability: Needle Storm: Magnus unleashes a cloud of needles, and fires them all into one direction, doing 250 damage. Cause of Death: Driven to insanity and killed by a corrupt government official. Backstory: Dollie's real name was never recorded. She was born at home and never legally recognized as alive. She was born to abusive parents who disowned her and her old sister when she was five. Her sister gave her her favorite doll, who she named Dollie. They managed to live off the land and the generous assistance of others until one government official, mad with power, decided to kill anyone who was homeless secretly to better improve the image of the city. Dollie - or whatever her real name is - was forced to watch as her sister was tortured to death. This set her off the edge. She tried to take a gun from a guard, only to have a shot driven through her heart - and Dollie's at the same time. Appearance: Always possessing a doll. The doll has long, flowing, dark blue-gray hair, and wears a pink dress with yellow flowers with five petals. Inventory: Asmowatch: Watch that all undead has. does not take up a slot. Slot 2: Razor Dress: A Chain dress that is razor sharp, anything fleshy that attacks her via melee and not with a weapon will take a small amount of damage via being cut by the dress. Slot 3: Voodoo Doll: A strange doll often used in Hexing Rituals. Dollie is Giggly: Turns an enemy with critical health into a Soul in a Jar, if there are any jars left. Souls in Jars, when used, turn back into jars and apply [HASTE] for one battle and [DOLLY ATE A SOUL] for two. Move has a low (~1/4) chance to work at 1/4 HP, and a much better chance to work (~3/4) at 1/8 HP, but it never works against bosses or opposing players. Dollie Can't Become Incorporeal: Dollie doesn't have any perks or drawbacks related to incorporeality. Dollie Needs to Get a Bigger Pair of Arms: Dollie can't use big weapons. Dollie is Angry: Dollie's beastly form can only be reached whilst under the effects of [DOLLIE ATE A SOUL]. One Time Ability: Did I Mention Dollie's Hair Can Turn Into Snakes Because Reasons? Deals 10x damage to all targets and inflicts [PETRIFY]. Cause of Death: Falling down a 2 metre staircase. His fragile constitution almost didn't let him live in his 3 first years, but his cunning and intelligence took him to a power position in the best point of his life however, he had bad luck in every single aspect of his life, making him to die most excruciating poor when he was walking in the street one day, only to meet his unfortunate demise. Appearance: He looks like a thinner and weaker version of an Anubis, his fur is black, he is taller however, but that only makes him see more thin, his eyes are of a surprisingly intense yellow color, wears a black robe. The Asmowatch: Does not take up a slot. Slot 1: "Betty": a revolver, dosen't uses it but it can be given, has 6 bullets, 60 damage each, it cant be reloaded nor can get more ammo. Slot 2: A robe of viscocity! : using his skills, he tainted his robe with a glyph, now, the damage is halved, but a part of the reduced damage is done in the next turn. Slot 3: A Quarterstaff: a regular staff, he uses it to walk, and not to fight. Slot 4: Ultimate Chimera Ward: Use this to prevent a chimera attack for a few turns. Slot 5: Spirit Silk: ghostly blue silk from Soul Spiders, used for Crafting. Slot 6: UUC Pity Pass: You have been spared... for now. Slot 7: Trapped Teleport Present: Open this when the time is right. Ability: Frizzle: A fire spell that will deal 70-80 damage on use. Bad RNGenes: Due to his genes, he doesn't get the normal health and damage upgrade, but reduced to a third, however, his magical abilities will get stronger and be used more often. Glyph-master: He can taint armor with runes to get benefits, however, it is completley random, and he cant just know what is going to get out! -Obviously won't work on greater enemies like bosses. Cause of Death: Has been shot by Molotov (that's a name of person, silly) when his safehouse in Russia has been burst through, and he refused to go in jail, getting into the brawl with the other people there. Backstory: While he had been the wanted criminal, he was in all of the circumstances - just another person persecuted by Russians. In fact, his previous life was rather full of various minor acts. He really was just an average slavic one, who was more about wasting his life in the low-paid jobs and protesting against the government. More of this isn't necessary, as it's the fluff. Appearance: Despite his flesh being a mix of greyish to blackish where it first started to rot, he seems to be rather elegant for the zombie. He wears a full greyish uniform, black short shoes, that aren't helpful in his current state, and while he has no wound sign visible, it's the rotmark that is shaped like the bullet wound. Under the uniform - green-to-black discolouration, and heavily marbled body. The hairs somehow still are there, albeit they're falling pretty quick. Slot 1: Personal document case - Useless in life, finds some use after death, somehow. +3 to defensive statistic, when held as a shield, 2 attack power when bashing using the case. May be sizeable enough to snuggle a weapon undetected (a small one, like a pistol or a dagger). Slot 2: Glock-7 - Personal Russian choice for defensive weaponry. Holds nine bullets a clip (the clip size is only used for description, and doesn't impact the weapon abilities), and has 13 attack power per shot. Slot 3: Family Sized Pizza: A large pepperoni pizza, an entire party can eat it. restores 100 HP. Aimed Strike - requires any gun. Grigor will aim on the target then fire, following the next action. It deals one-and-half times as much damage as normal strike, but hold up yet - it has increased chance to hit vital organs (Alas SMAAAAAAAAASH damage.) The second may not work if the foe has no weak points. Courageous - Even after death, Grigor doesn't fear seeing the true death at all. The damage done to him is increased by 25%, but so is damage done by him. Cause of Death: Stress-induced heart attack upon realizing that wearing a fedora makes him look like a neckbeard. Backstory: Fedora Ron's life was brief and unremarkable. He accomplished absolutely nothing during his time on Earth. The only time anyone took note of Ron at a party was this one time he wore his signature black fedora. After noticing that the fedora gave him some minor attention, he began wearing it every single day. Uses his fedora as a substitute for real confidence. After dying, he found himself in a strange new world with no idea as to what is happening. Appearance: 5ft 2in. 24 y/o. Skinny. Redhead. Wears a black fedora, purple t-shirt, blue jeans, and sneakers. Slot 4: a half-empty plastic water bottle. Slot 5: Sawed off Shotgun: A powerful weapon at close range, Damage of 80. Abilities: Cap Conceal - If threatened, Ron can remove his beloved hat and tuck it under his shirt. This causes attackers to realize how much of a "nothing" he is in combat, causing them to focus on attacking other, more threatening characters. Perks: Fedora Confidence - Ron's whole world revolves around this one stupid hat. While he has his fedora, he is generally more confident and assertive. If he ever loses his fedora, however, he will commit every resource at his disposal to recovering it ASAP. No exceptions. Backstory: The ultimate lifeform from the Chimera Labratory. Inventory: Ultimate Chimera Pass: Even you need to take pity sometimes, be sure to give this to someone you pitty to allow them a free pass and leave them alone. Infinite Trapped Presents: Be sure to place these, specify if you want them to be a Bomb in a box, a normal present, a mimic, or a teleport in a box. illusionary Ring: a ring that can sometimes cause enemies to hit an illusion of you instead. Basic Attack: CHOMP: Instant kill a player, deals a base attack of 80 to enemies. Ability: PSI Shield Ω: Applies a psychic shield that will block all PSI attacks and lesser spells. Ability: Vicious thrashing: The Chimera thrashes with his tail hitting all enemies for 75 damage. Ability: Diamondeyes: Glare with a diamond inducing gaze, low chance of [DIAMONDIZE]ing an enemy, will work 80% of the time on players. Ability: Warcry: Like roar but can only be used on enemies. 50/50 chance of working. Passive: AFK Farming: You instantly teleport and bite down killing players who aren't being protected and not doing anything for over 5 turns without giving a warning to the GM. Passive: CAN die: But players cannot kill you. Passive: Cannot act first on player meeting: this gives a chance for the player to run. Passive: Permahaste: Can act twice in one turn. One Time Ability: Roar: Will paralyse all players that hear it for one turn. Oh boy, I can't wait to be an absolute monster upstanding citizen, I hope you we all can die have fun together! Demon God Ivuul likes this. As I always do. Have a thing. Ghost Mug: A mug he broke and now it haunts him, he can also throw this at people. Racial Perks: Blah blah Ghost spookiness. Suicidal tendencies: Lesser enemies have a 50% chance to commit suicide, applies separately to each enemy. You want a hug Fred? Scalpel- A good memory from a dead friend. Customized Nagant M1895 Revolver- some Russian would pay a pretty penny to have it back. Vein Thresh- Phaedra strikes accurately with his scalpel to extract a blood vessel from an enemy, lowering their damage output and doing 30 damage. Phaedra can drink the blood for health or a TYFYC effect. I’ve been waiting for a game like yours but no one has done it nearly as well as you (yes I read a good bit of the old chapters) so YAY! I get to play something made by DGI! Armageddon: an intricate great-sword that he used to strike down vampires before he became one himself. 25 damage. TheSpeluknerv3.6.5.8.6 and Demon God Ivuul like this. Cause of Death: I got stabbed in the gut with a great-sword, kicked in the crotch, then bitten by a vampire, wonderful. Backstory: as a very egotistical and outright jerk not many people liked him in life, and even less in death. He was an adventurer in the 1300s looting (and burning) villages with groups of others. Notorious for killing 10 vampires in his lifetime then being stabbed, kicked, and drained of his life essence by his 11th hunt, the crusader surprisingly didn’t die from what would be fatal wounds to a human, becoming a vampire. Looks like you're moving up dude! @Person999 Feel free to join the discord! We talk about the game, our characters, and just have some fun. You can meet the other players there too! Well, time to do app analysis or something. In reverse order. I won't say anything if I'm fine with it. Changing up the format a little, from my usual, less work, more fun. Blue is usually advice, you won't see much of this, my goal is to be evil, after all, usually me not-so-subtly pushing for an optimisation in the process of calculation. Red is my evil side talking, you'll probably see a lot of red in many apps, either making jokes, or approving of things that make things easier for me. Purple is concerns, you won't see these, unless things are vague, or obviously bad. For the sake of brevity, I cut out backstory and stuff in my lookovers(unless there's important details not mentioned in the app itself), given my analysis is mostly focused on stats, and the like. Crusading armor of crusading: that armor I talked about earlier. 2 Defence. Y'know what, next time I'm just gonna bring up problematic stuff, and if I find nothing personally objectionable, say I'm fine with it. So I can only presume you are going with a character that 'sticks' to evil ways, given that these 3 perks will make it very difficult to become good, this is probably to discourage good aligned play though, I presume? If so, I approve for sticking to it. Phaedra is an in-depth neutral evil. He values respect and loyalty above all else. He values his friendships, although he would never let his friends know how much he cares for them. His motives and intentions differ from situation to situation, but he's willing to do whatever it takes to protect those he loves, whether or not that means letting a few heads roll. So I suppose, yes, evil play would align better with his character than good play in most situations. I done edited the app. Monk’s Bow: 15 damage. An old, worn bow. Monk’s Robes: 5 defence. Can be worn under most other armors, he must always wear it, and for better or worse it shows everyone else he is not of their religion. Mr. Fury the Bootleg likes this. EDIT:It's been changed now, this message is no longer relevant. I guess you would basically say whatever the monster is gonna do during the next turn and Garrun does his move first? I didn’t think that part through. Here's the thing though, you are telling me to abandon tactics that I haven't even thought of yet, your ability forces a restriction on my combat. B0ring Assassin sends a B0ring Shot through Hostile Target Dummies A, B, and C.
Well, they get hit, tough luck for me, I'm fine with that, but it allows me to adapt to that ability existing. British-Accented Future Boy casts Cyclone on Hostile Target Dummies A, B, and C.
Hostile Target Dummies A, B, and C rush British-Accented Future Boy, but he gets a vision, he sees that they are going to fire lasers at him. British-Accented Future Boy casts Mage-Shield Buff on himself, negating the damage. Hostile Target Dummies, despite seeing him casting this buff, cannot change tactics, because unlike British-Accented Future Boy, they effectively lose their free will by virtue of having all of their actions after turn 1 being announced, meaning that combat can be compromised by virtue of you being mentally prepared to counter/dodge everything. EDIT:This message is no longer relevant. A. I can change the ability to balance it if you want. B. I really should change that, shouldn’t I?